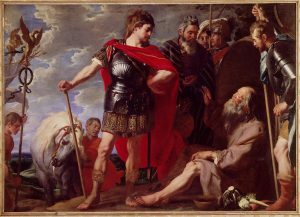 It seems clear, however, that Diogenes of Sinope, the true archetype of the Cynic philosophers, believed that possessions were a trap and what people called `manners’ were simply lies used to hide the true nature of the individual. He was known for brutal honesty in conversation, paid no attention to any kind of etiquette regarding social class, and seems to have had no problem urinating or even masturbating in public – and, when criticized, pointed out that such activities were normal and that everyone engaged in them but hid in private what he did openly. When Plato allegedly was asked what sort of man Diogenes is, he responded, “A Socrates gone mad”. 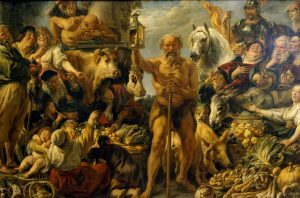 Diogenes’ sense of shamelessness came from his conviction that human beings live artificially and hypocritically and would do well to live like dogs, performing natural body functions in public with ease, eating anything, and making no worries about where to sleep. Dogs live in the present without anxiety, and have no use for the pretensions of abstract philosophy. 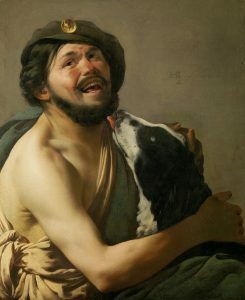 From that moment on Diogenes had decided to live like a dog on the Corinth marketplace. 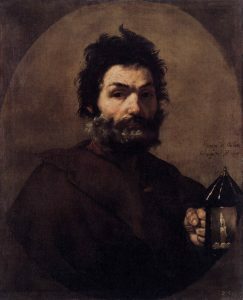 In his disdain for what he regarded as the folly, pretense, vanity, self-deception, and artificiality of human conduct, one day he even strolled about the marketplace in full daylight with a lamp looking for ‘an honest man’, which of course he couldn’t find. There are conflicting accounts of Diogenes’s death, but the most striking version is that one day he just decided to hold his breath.